Saturday, August 22, 2015. Chaos and violence continue, protesters are attacked, Haider's fealty to Big Oil is called out, Ammar al-Hakim's star is on the rise, and much more. Starting with violence and oil. Last week, #Iraq's forces announced dozens of dead gunmen in Alas/Ajil oilfields (released pics), not a single 'journalist' wrote a article. One of many stories not covered. If there's news value in it, the only news value in it -- one that this Shi'ite propagandist Haidar Sumeri will never grasp -- is the strides that the Iraqi government will take to protect oil while the citizens are left to fend for themselves. In other poor visuals, Iraqi prime minister Haider al-Abadi made a special visit today. Aref Mohammed, Ahmed Rasheed, Isabel Coles and William Hardy (Reuters) note, "Hundreds of locals recently blocked some entrance to Iraq's giant southern West Qurna-2 oilfield, operated by Russia's Lukoil, demanding jobs in a sign of the growing challenges facing foreign firms operating in the south." So Haider rushed there today in an attempt "to reassure Lukoil." Time and again, Haider puts oil first, ahead of the Iraqi people. This morning, Arwa Damon (CNN -- link is video and text) reported on the situation in Anbar Province's Ramadi noting that deputy provincial council head Falih Essawi is issuing "a dire, dire warning" as the Islamic State advances. Arwa Damon: ISIS forces, it seems, early this morning managing to enter the outskirts of the city of Ramadi from the east. This now means that ISIS is fighting on the east. ISIS advanced from the north -- taking over three towns from the outskirts there over the weekend. The routes to the south already blocked off. The city basically under siege except for the western portion that is still controlled by forces, by government forces, but that is wavering as well. Pentagon officials stopped short of saying the city was on the brink of falling. But they didn’t sound confident it would hold, either. “Anbar, and especially Fallujah, is like Asterix’s village,” said Victoria Fontan, a professor at American University Duhok Kurdistan, referring to an unconquerable town in the French comic book series. The province is packed with experienced fighters and while some Sunni tribes have allied with the government, others are fighting alongside ISIS or sitting on the fence. Local knowledge is seen as key to retaking territory along the fertile strip lining the Euphrates, where ISIS has inflicted severe military setbacks to the police and army since June. Iraqi Spring MC notes this takes place as calls for reinforcements of government troops to be sent to . . . Baiji. That's in northern Iraq, Salahuddin Province. These reinforcements are being sent in to protect . . . Well, not people. There are people in Ramadi who need protection. But the government forces going to Baiji are going to protect an oil refinery. Oh, yeah, the Islamic State seized Ramadi -- which they still control today. 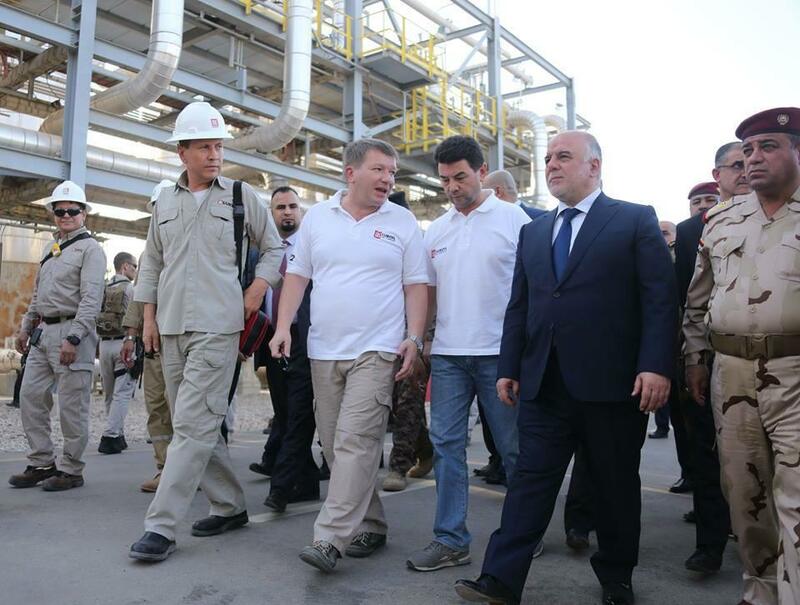 But, hey, that refinery in Baiji, that oil refinery is safe. Iraq Times reports the reaction to citizens in Basra which was to protest Haider's visit. The activists noted that he traveled all the way to Basra to reassure Big Oil but he did not meet with a single local protester to address the concerns that have had them pouring into the streets for the last weeks. The report notes that the British and US Ambassadors to Iraq had lobbied Haider to visit Basra to reassure Big Oil. As Iraq Times also notes, just north of Basra is where a protester -- protesting against Big Oil -- was shot dead by security forces working for yet another foreign oil company in Iraq. There was a time when -- even under the despicable Nouri al-Maliki -- if foreigners killed an Iraqi citizen, it would be time for immediate arrests and a kangaroo trial. But in Haider's Iraq, foreign oil companies can kill protesters and the government doesn't even publicly object. Basra protesters are targeted in many ways. Protesters demanding government reforms have cut off road access to Iraq's southern Umm Qasr commodities port, officials said on Saturday, hampering activity at the harbour which receives grain shipments and heavy equipment used in the oil industry. Dozens of demonstrators, who have closed the port's two main gates since Friday morning, set up tents overnight and refused to let trucks pass or employees enter the facility, said Ammar al-Safi, a spokesman for the state-run General Company for Ports of Iraq. The demonstrations came in response to calls initiated by the civil movement against corruption and called for swift action to be taken against corruption and “corrupt” government officials they hold responsible for continued electricity outages, water cuts and rising unemployment rates, reported Aljazeera. Protesters also demanded the reformation of the judiciary and the elimination of sectarianism throughout government institutions, reported Aljazeera. The protests are a continuation of demonstrations that started in July as hundreds took to Tahrir Square in Baghdad calling on the government to meet their demands. The protests have continued on a weekly basis, usually erupting on Fridays. All Iraq News quotes Ammar al-Hakim declaring, "The reforms must be comprehensive and should respond to the citizens' demands. We will defend our country with our souls and blood to prevent anyone who attempts to steal achievements." If true, this would be among the biggest news in Iraq. Ammar al-Hakim is the leader of the Islamic Supreme Council of Iraq and, as Arabic social media is noting, he's currently in Iran currying favor. While al-Hakim remains tight with Iran, he's drifted from the United States. He's taken to slamming the US and its involvement in Iraq in the last 11 months. And the US government has made very little effort to address that. We warned about it here. But apparently the administration knows better and they can blow off and dismiss al-Hakim.